How do you approach your birthdays? With sadness, apprehension or happiness? I know what you are thinking, 'why would anyone be happy about turning old?!' Gotcha! I am turning thirty one today (don't roll your eyes please, I have no issues sharing my age in public). I had written about my feelings on turning thirty last year. The only thing I would like to add to the list is a Malayalam movie title 'samsaram arogyathinu hanikaram', which basically means - talking is bad for health. The movie was horrible, but the meaning of it's title resonates with me so much right now that it cracks me up every time I think of it. My thirtieth year was good, Alhamdulillah. I attended couple of weddings, had family members over for Ramadan and Eid, our children reached few milestones, had a grand family get together in December and at work front, I was able to get a new website designed for PPS and pay for it in full - a huge achievement for me personally. I had my share of pain as well, that is what life is made of, right? I wish I could share them all here as writing heals me. However, due to them being really personal issues, I won't be able to. I could share this recipe for coconut milk pudding though, which was given to me by my sister in law. Let me tell you, she is the Queen of puddings. I am not exaggerating. Whenever we are in Kerala on vacation, she whips up tasty concoctions which only she can come up with. They are decadent, heavenly and very bad on your hips, but hey, you are on a break! Whip the heavy cream in a bowl for a minute or two. Add condensed milk and whip again. Add coconut milk to the mixture and continue whipping at a slower speed. Melt gelatin in some warm water and add it to the above mixture. Whip lightly until everything is mixed well. Transfer to a pudding dish and refrigerate till the mixture sets. Top it with whipping cream. To make toasted coconut - take 1 cup freshly grated coconut and add quarter to half cup sugar and few broken cashew nuts. On a frying pan, roast them all together on medium heat. Keep stirring until they turn brown. Let it cool and decorate the dessert. 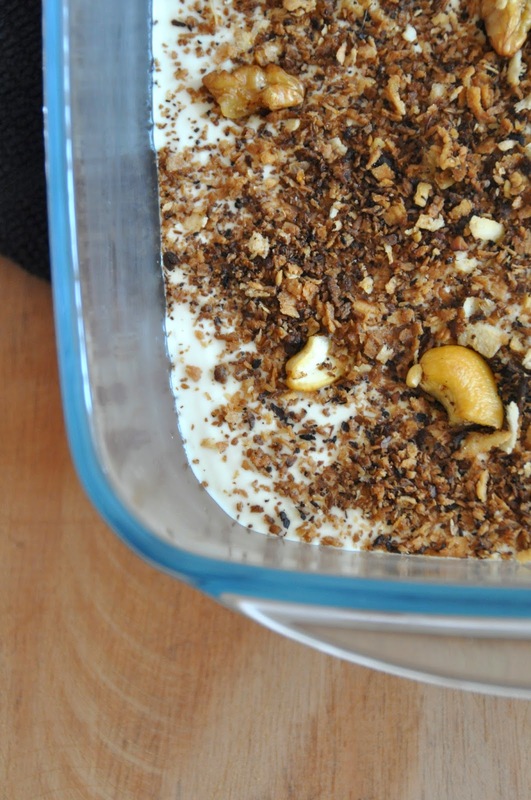 You can also save the leftover coconut for later by refrigerating it in an airtight container. As much as I loved the lightness of my sister in law's coconut milk pudding recipe, I prefer not to meddle with gelatin and china grass because of which I tried different combinations of thick cream and coconut cream inspired by the very popular Serradura and Mango Cream Pudding. Since the pudding has two kinds of cream, I decided not to use whipping cream. I have also halved the amount of condensed milk as J and I prefer puddings that aren't too sweet. If you are like us, you might want to try out my version. Both are scrumptious! Chill the coconut cream tins in your refrigerator for few hours. Later when you open them, you would find cream on top with water underneath. Scoop out the solid and discard the liquid. Set aside. Add coconut cream to the mixture and continue whipping at a slower speed until all three are mixed well. Transfer to a pudding dish and leave in your refrigerator to set.